Event countdown clock is suitable for a variety of applications. Our countdown clock has special future event countdown, such as birthday, anniversary, wedding day, birth delivery day, presidential election day, school day, Olympic game, or even for filter lifespan countdown. Also, various types event countdown clocks are available, credit card day countdown, stick-on day countdown, desktop day countdown, wall mountable day countdown, watch pen day countdown, and portable day countdown. 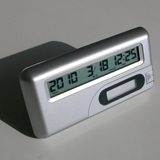 Two types of LCD display format available, 4-digits, and 12-digits. For 4-digits, display shows days of remain, while the 12-digits shows days, hours, minutes, seconds, and 1/100 seconds of remain. For the 12-digits day countdown clock, the alarm feature is included while countdown is expired. 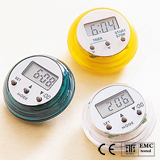 The model TR390, and TR810D countdown clocks are a day adjustable timer with maximum setting capacity of 9999 days. Therefore they are good to set countdown to a particular event day in future too. While TR810S-365D event countdown timer is a yearly timer. People can apply it to set their annual anniversary.